Height to top - 170 ft. Height to focal plane - 156 ft.
Light pattern - On 2.5 seconds, off 2.5 seconds, on 2.5 seconds, off 22.5 seconds (total- 30 seconds per cycle = two full cycles per minute). Open to public to climb - Yes. Tickets are $8 for adults and $4 for senior citizens (62 or older), children 11 and under, and the disabled. Ticket available from 8:45 am to 4:25 pm. Climbs begin at 9 am. Location - 4 mi. 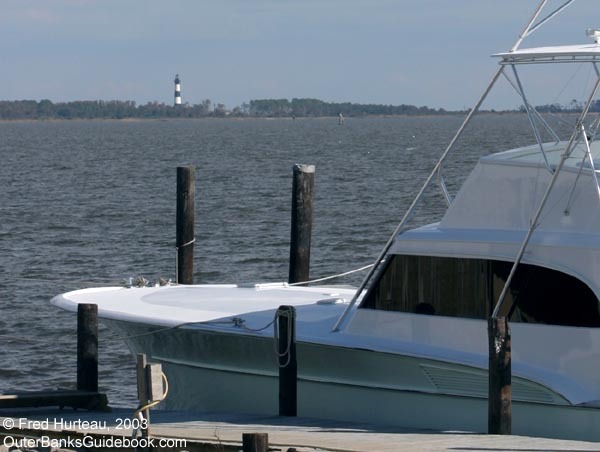 north of Oregon Inlet, and 7/10 mile south of mile marker 22, south of Nags Head. 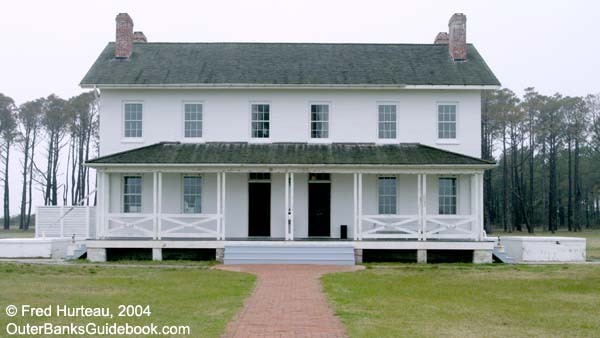 Keeper's House - Renovated exterior and downstairs interior as visitor center and gift shop. 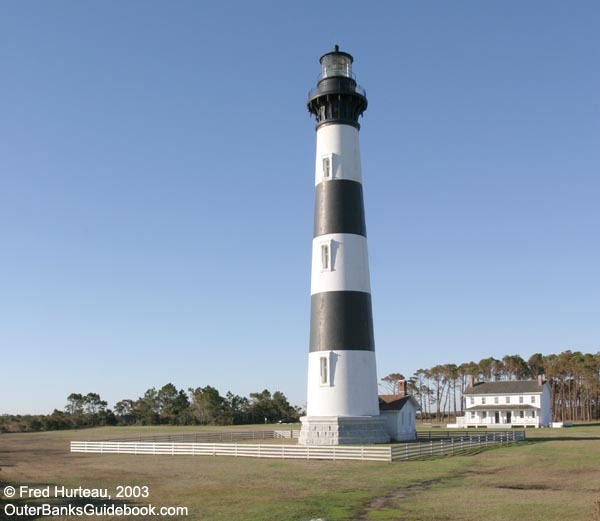 How to get there - From intersection of US 64, US 158 and NC 12 at Whalebone junction (at Nags Head), take Highway NC 12 south 5 3/4 miles through Pea Island National Wildlife Refuge toward Oregon Inlet. Turn right 7/10 mile south of mile marker 22 at entrance sign (plainly marked, but can be missed if you're not watching closely). 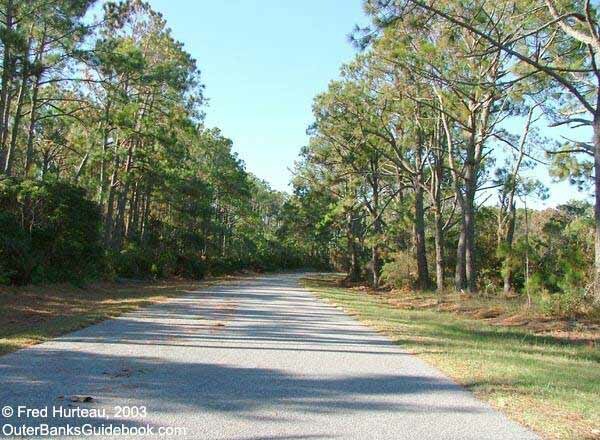 Paved drive (approx 3/4 mi.) 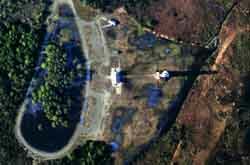 through pine woods ends at the lighthouse grounds, with parking and loop drive. 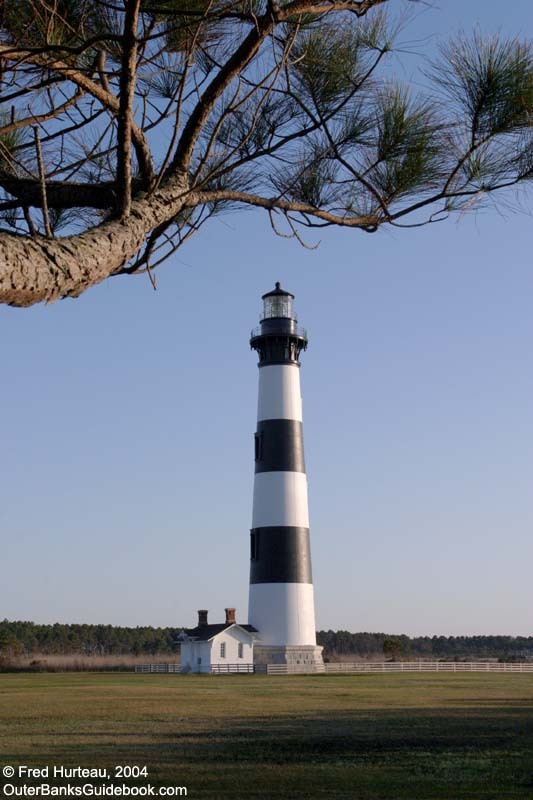 Each of North Carolina's lighthouses has its own character and "feel". Bodie Island Lighthouse could be characterized as being more isolated from modern intrusions than any of the others, except perhaps for Cape Lookout, which is more physically isolated. The only visual intrusion here is the power line that runs along Highway NC 12. But it only interferes with what would otherwise be a pristine view from the highway. 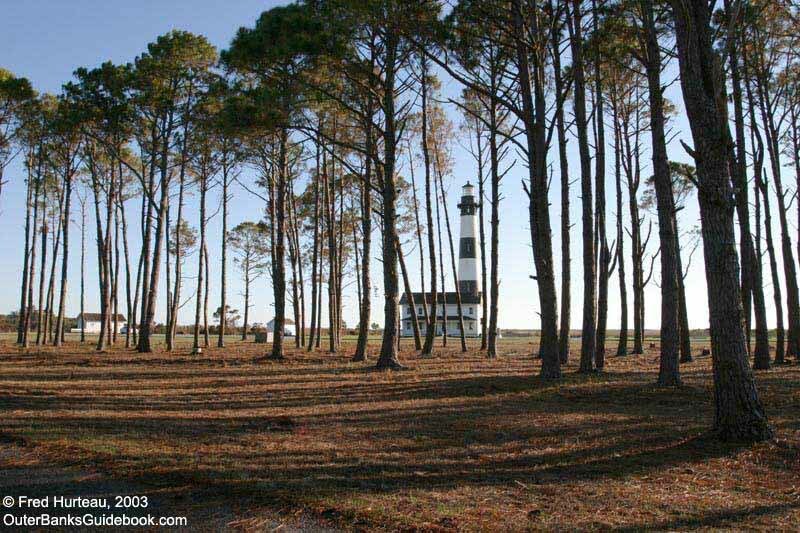 Once you drive down the pine-shaded lane from the highway to the lighthouse grounds, you are away from everything but the lighthouse and its buildings. 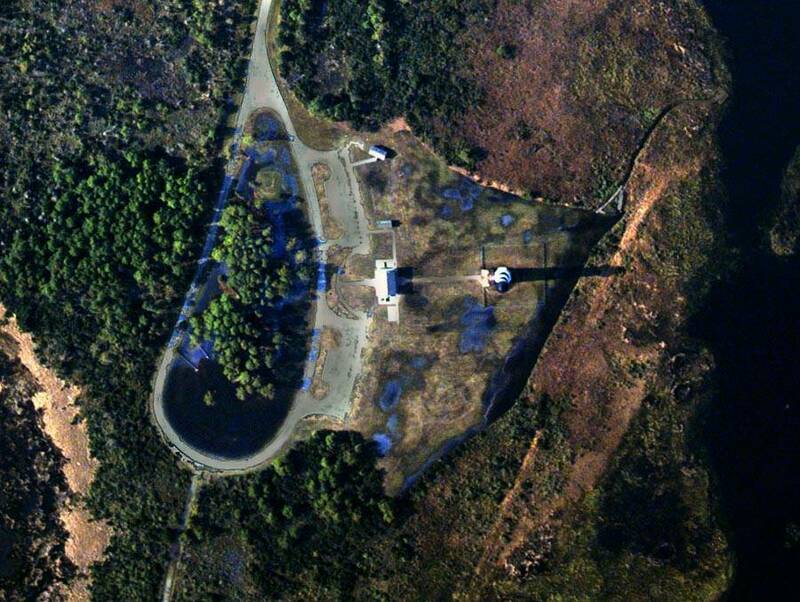 Trees, marsh and freshwater ponds surround it completely. It's almost impossible to see cars on the highway a good half mile away. It's quiet and peaceful here. Be sure, though, to bring mosquito repellant if you visit any time other than in the dead of winter. 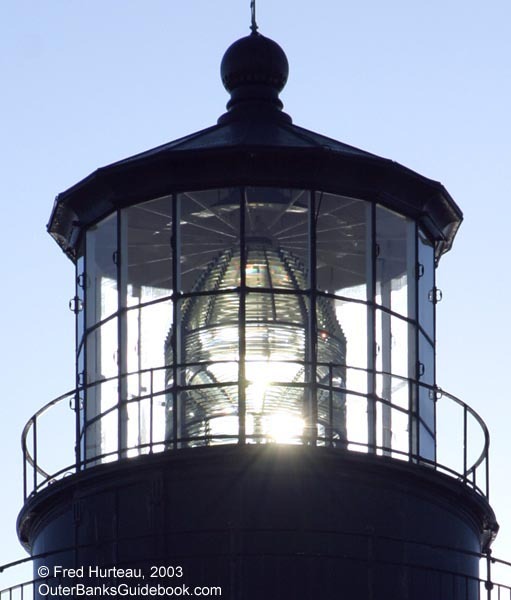 But then, that is good advise for all the other lighthouses as well. 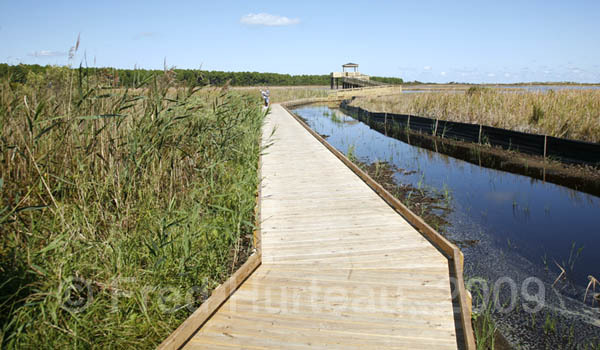 This location also provides nature trails for those interested in bird watching and other such activities. 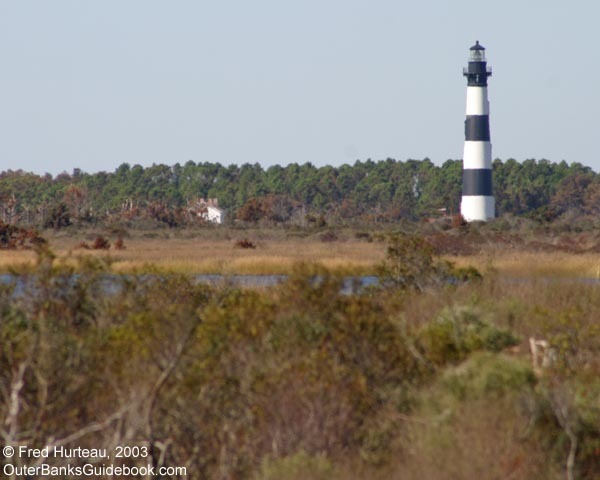 Left: Looking eastward from the loop drive, tall pines north and west of Bodie Island Light contrast with the open marsh and ponds east and south of the grounds. 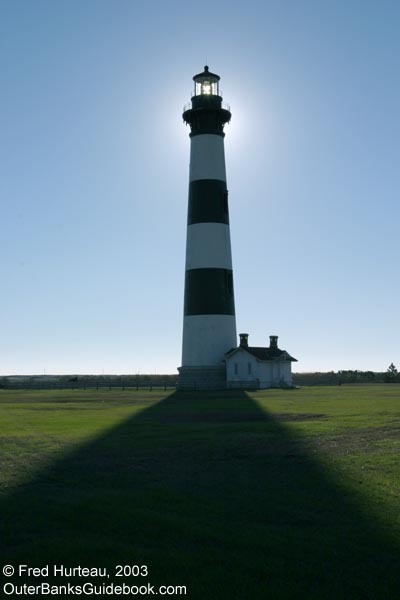 Above: A bright October morning sun and cloudless sky at Bodie Island Lighthouse. 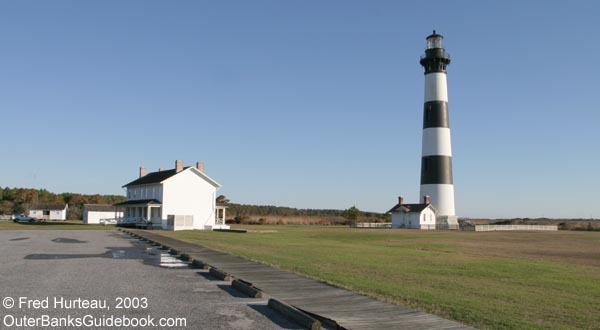 Right: Bodie Island is a photographer's delight, with unlimited views & unobstructed light at sunrise and sunset. 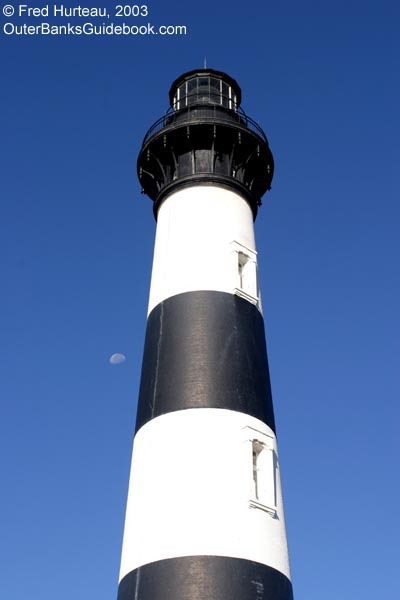 Bodie Island Lighthouse lends itself well to photography, because you can get so many different angles and looks. This is mostly due to the fact that it is visually isolated. There is nothing to interfere with the view, except physically getting yourself around in the marshy, bushy, mosquito rich environs to find the angle for the photo you want. You can get at it from all directions to take advantage of the light, whatever the time of day. With a little effort, you can get some nice photos. 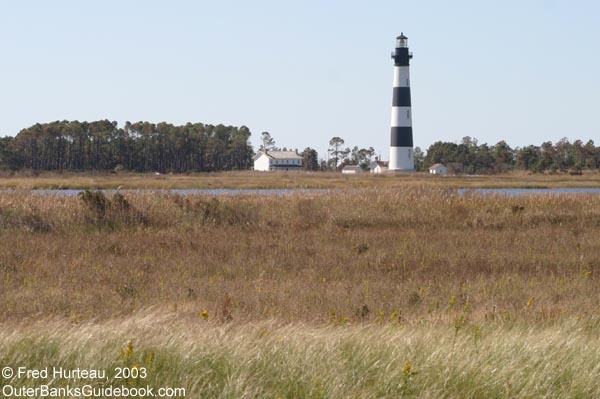 Bodie Island Lighthouse is visible from the area around the US 64/264 bridge at Roanoke Island crossing to Nags Head (left photo), and from the Wanchese area on Roanoke Island (right photo). 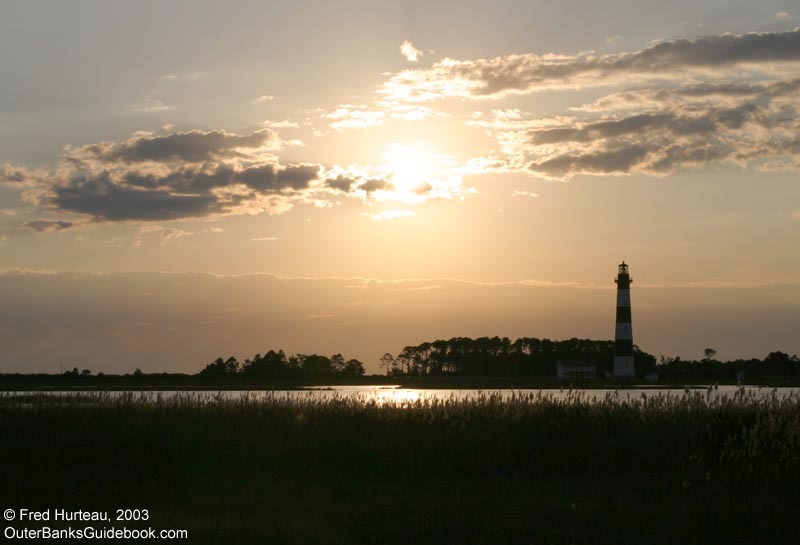 It can also be seen from the bridge connecting Festival Park to the Queen Elizabeth II in Manteo. 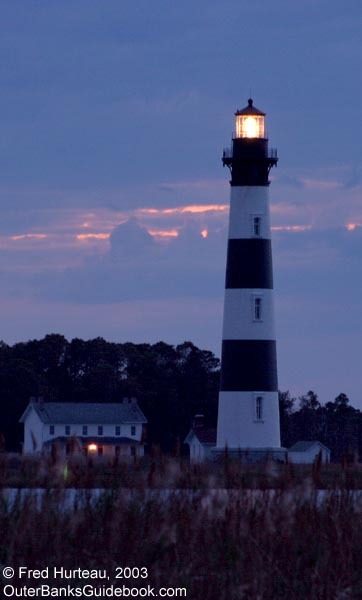 Admiring Bodie Island Lighthouse from a distance is nice, certainly, but up close it is even more striking. The wide open space around it allows you to view it without obstruction. 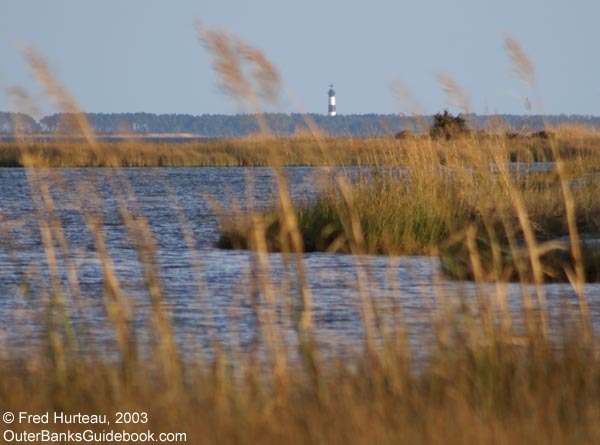 It stands out boldly against the simple low-country background of marsh and sky. Bodie Island Lighthouse, like its twin, Currituck Beach Lighthouse, has a beautiful First Order Fresnel lens. The photo at right shows the morning sun beaming through the lens. 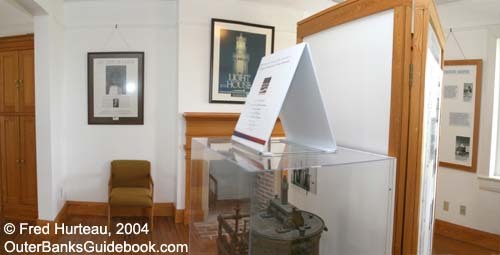 At the far right you are standing in the shadow of the lighthouse as the sun creates a glowing halo around the gallery and lantern room. 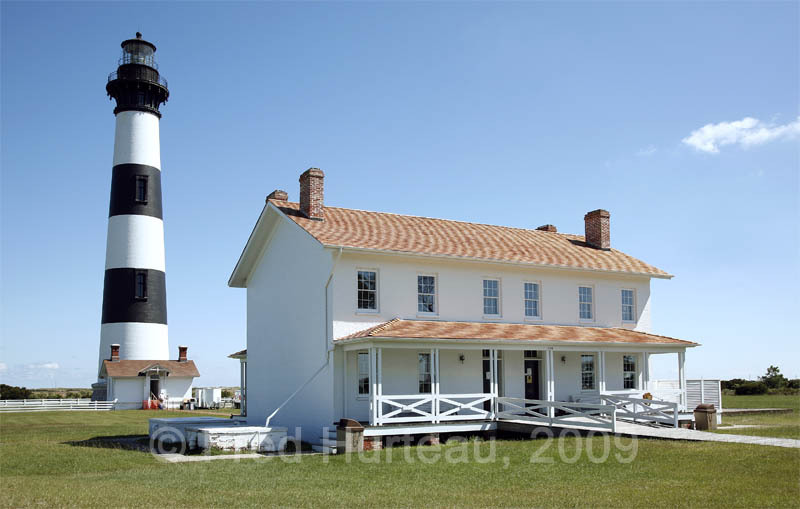 Bodie Island Lighthouse is the only one still with a ladder from the gallery to the lantern room windows, as shown in the photo at right. 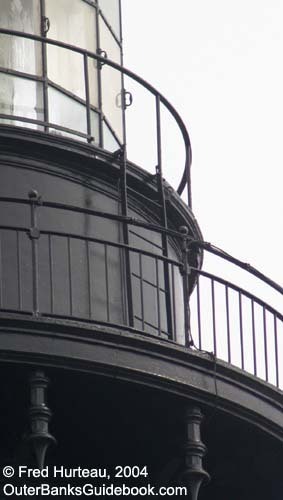 The ladder can also be seen edge-on at the right side of the lantern room in the photo at left. 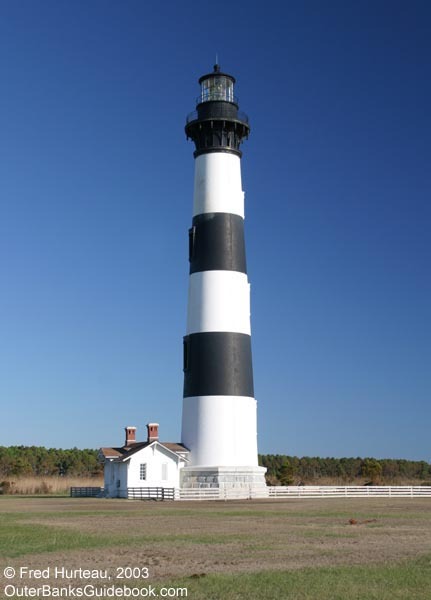 Reasonable speculation would suggest that Currituck Beach Lighthouse and probably Cape Hatteras Lighthouse used to have one. 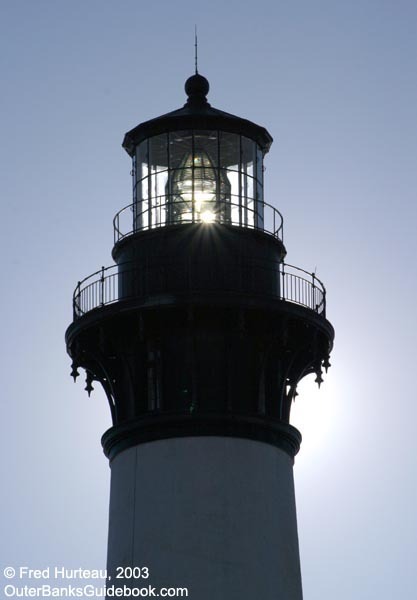 If so, it's likely they were removed when the lighthouses were opened to public climbing. 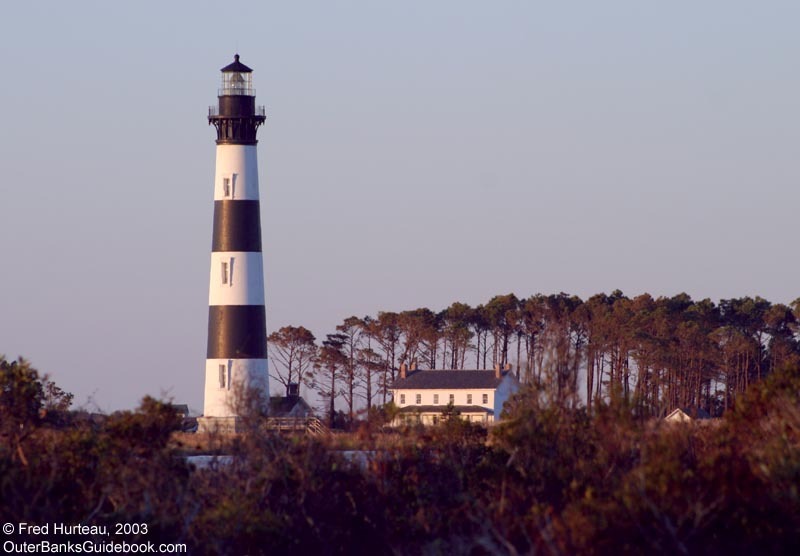 Since Bodie Island is not open for visitor climbing, the ladder remains in place for now. 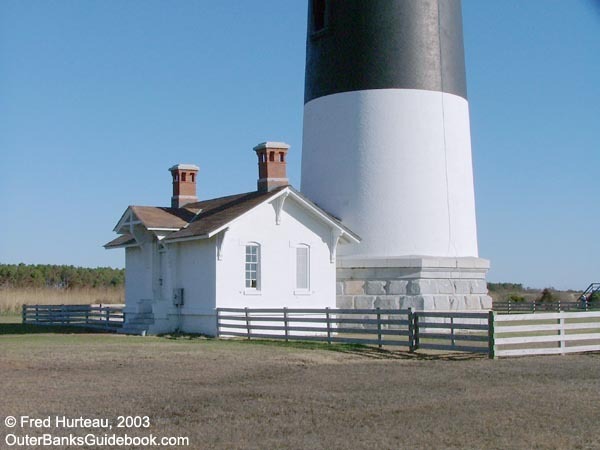 Like the Keeper's Quarters at Cape Lookout, Cape Hatteras and Currituck, the Keeper's Quarters at Bodie Island is a duplex. 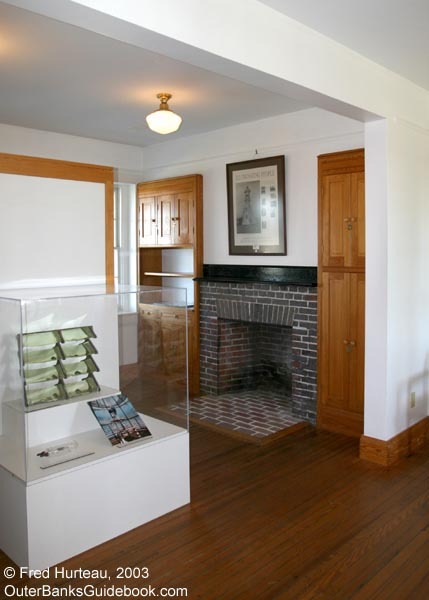 The two halves of the house were mirror images of each other, separated by a central wall. 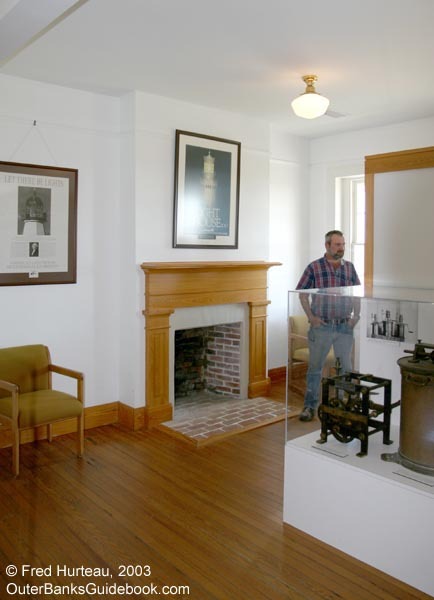 And like the others, the wall separating the two halves was opened up when the Keeper's Quarters was restored, making it more accessible as a museum and visitor center. 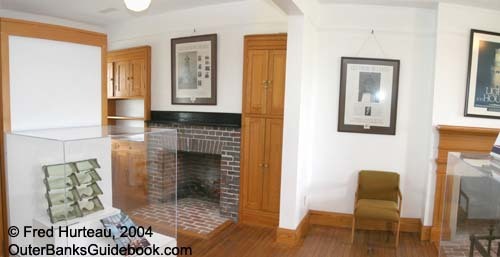 Two panoramic photos above, and interior photo at left show the museum area in the Keeper's Quarters. 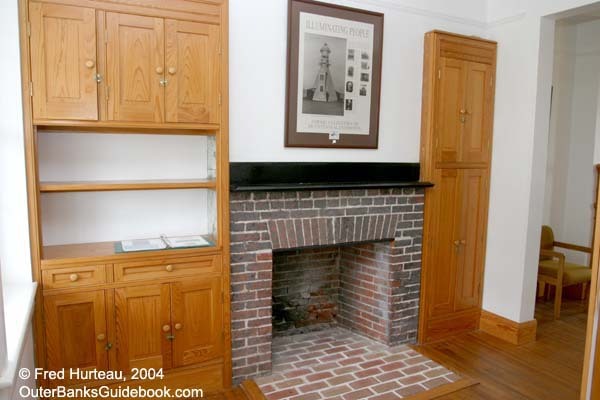 Originally two rooms, the wall was removed to make the space suitable for displays. 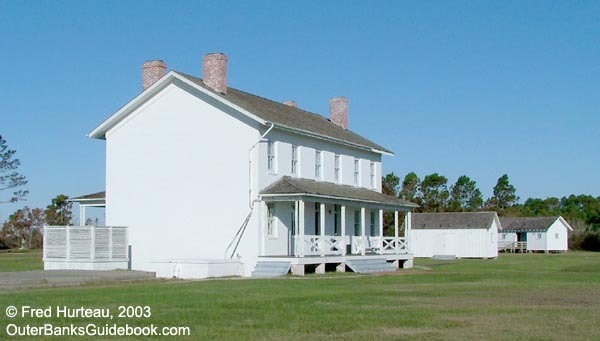 The south side rooms, also combined into one, now serve as a gift shop. The north stairway and central hall is shown at right. 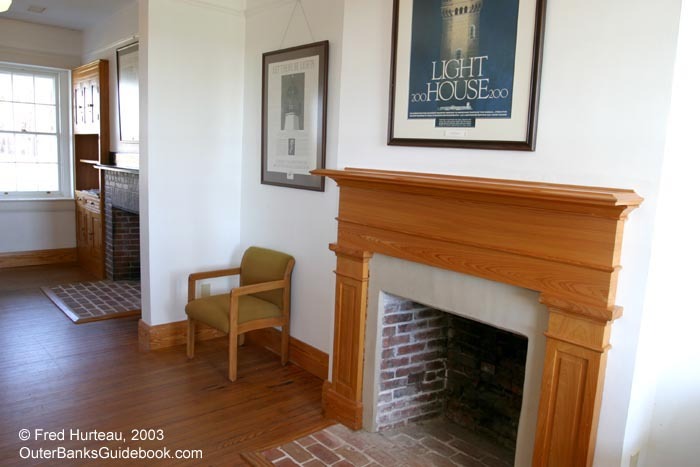 The upstairs area is not open to visitors. 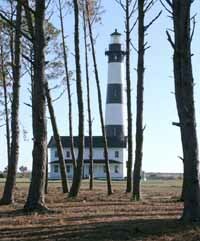 The current lighthouse is the third named "Bodie Island". 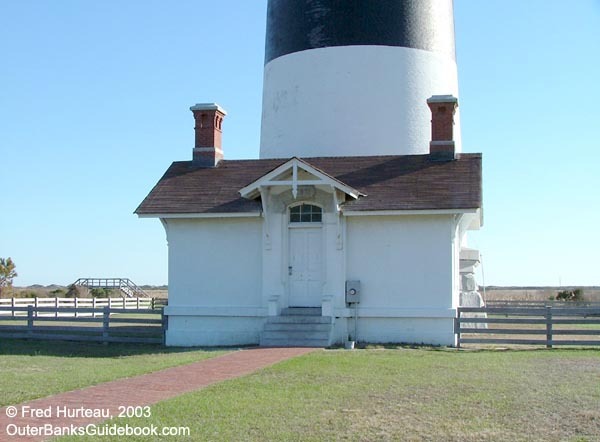 It was built by Dexter Stetson after he successfully completed the present-day Cape Hatteras Lighthouse. 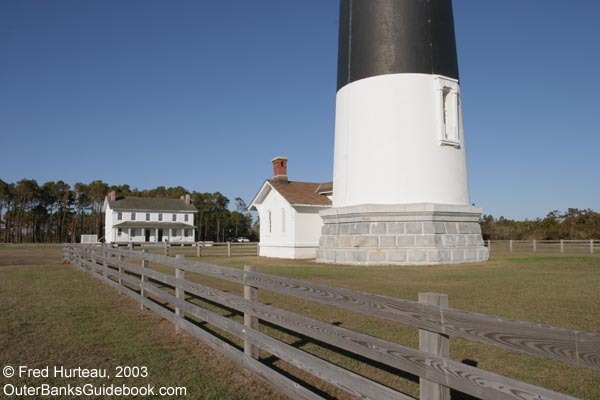 The first Bodie Island Lighthouse was built in 1848 without a proper foundation. It soon began listing and was eventually abandoned. 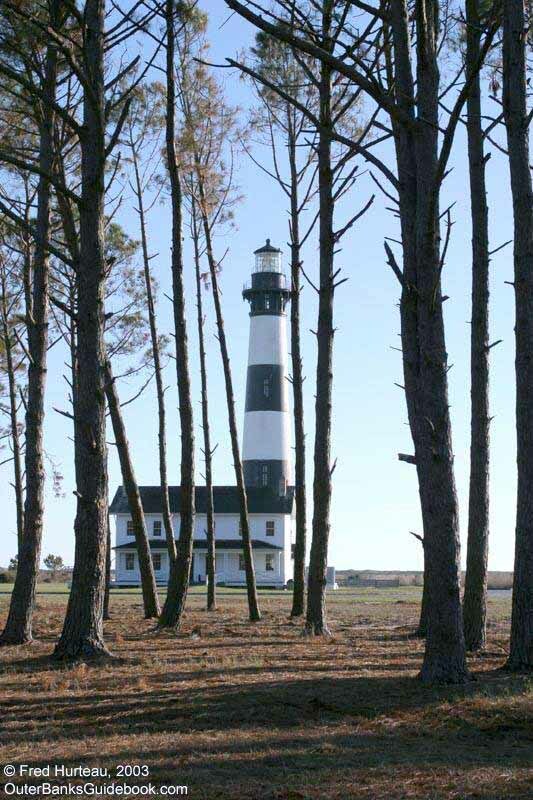 The site of that first Bodie Island Lighthouse presently happens to be under water in the middle of Oregon Inlet, because the inlet moved drastically between 1862 and 1879. 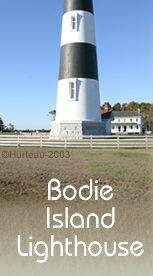 The second Bodie Island Lighthouse was destroyed in the Civil War just three years after it was finished. 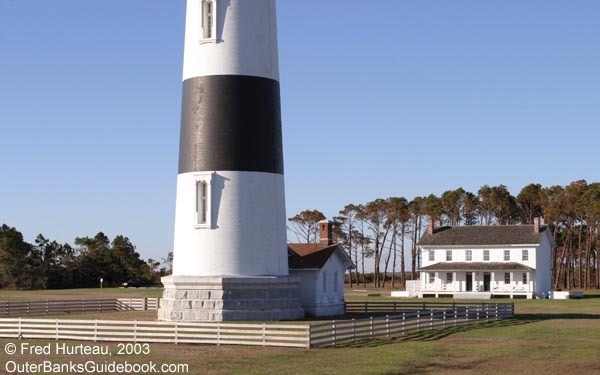 The long awaited restoration project to preserve Bodie Island Lighthouse and make it safe and accessible to the public again was well underway in October of 2009. 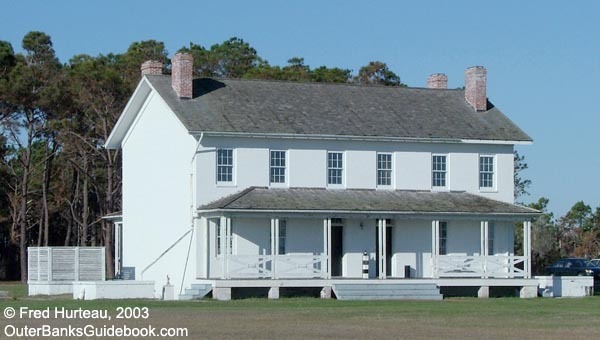 The keepers house had already received a new wood-shingled roof. Also, a completely new boardwalk connects the restrooms by the parking lot with the new and improved viewing stand out by the ponds. The old high viewing stand at the corner of the grassy lot is gone. This new structure makes the viewing stand handicapped accessible. now. 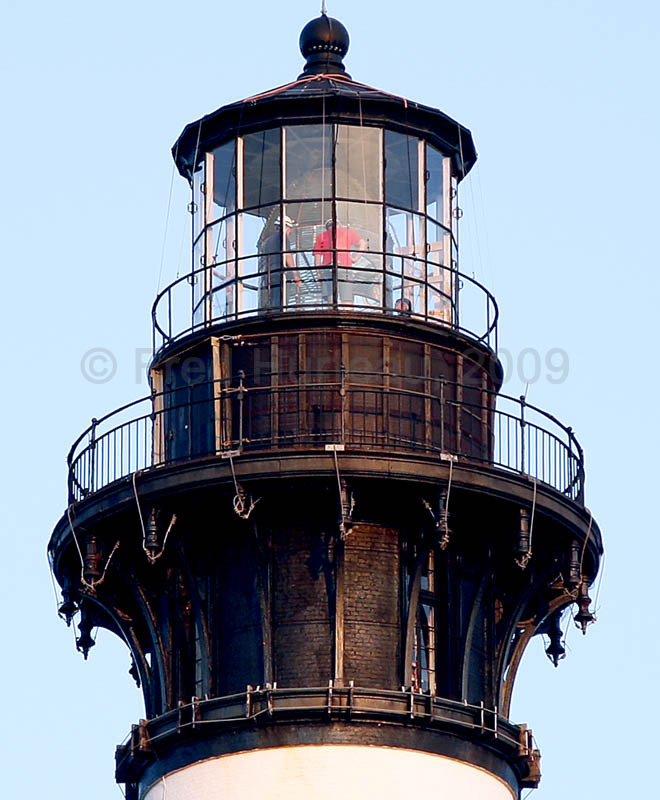 What is not so visible is the work going on inside the lighthouse itself. 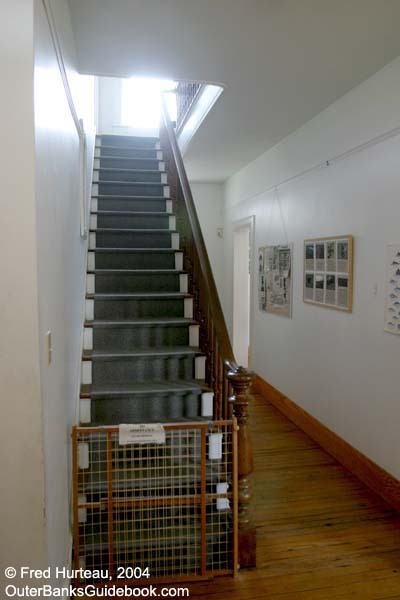 The deteriorating metalwork of the stairs, gallery and beacon room are being repaired. 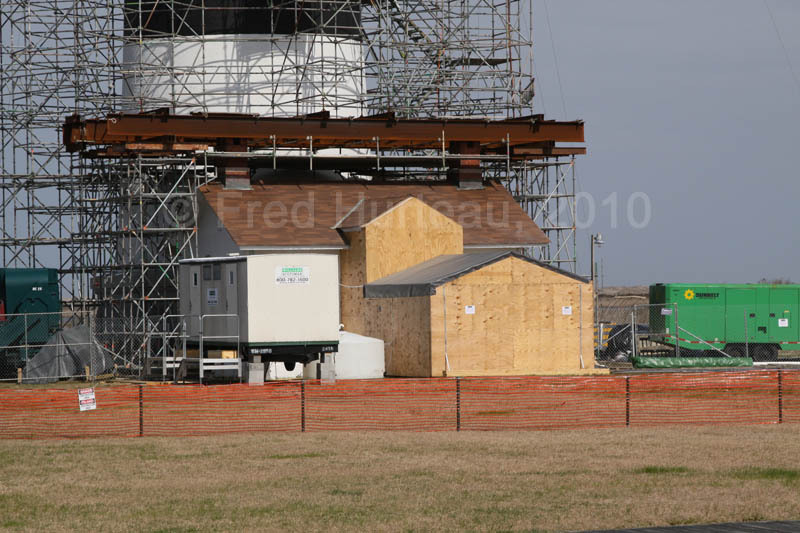 The electrical wiring and lightning protection are all being upgraded as well. In the meantime the gallery and beacon room are held together by a web of steel cables strung all around the outside. 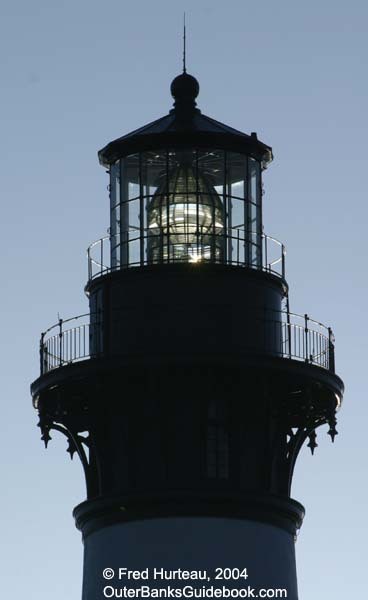 This can be clearly seen in the photo at top right as workmen inspect the fresnel lens. By March, 2010, it is clear the restoration work is getting serious. 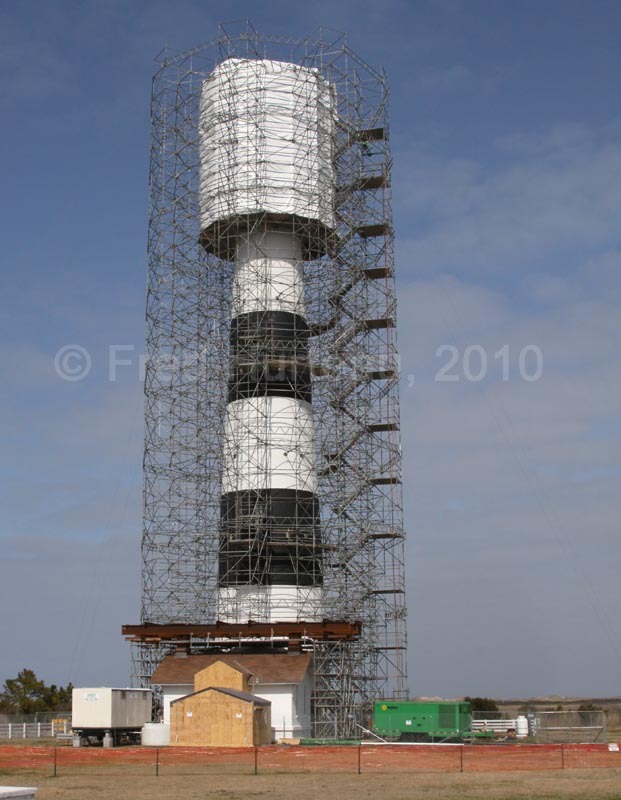 The lighthouse is sheathed in scaffolding from base to tip, and the top is covered to keep wind and weather out while crews work on the restoration. 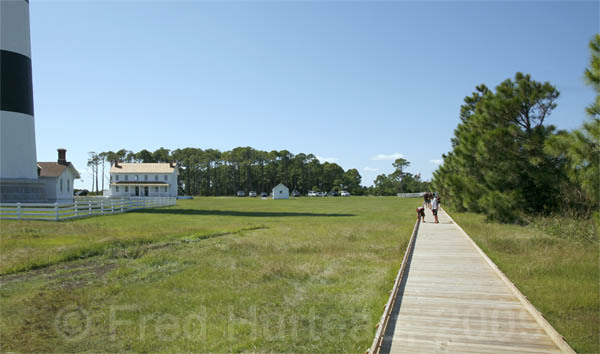 Panoramic view from atop Bodie Island Lighthouse looking ENE to SSW. We've only scratched the surface on this first page. Take a look inside the lighthouse and see more exquisite photos of Bodie Island Lighthouse on page 2.